Bointec DP809K is a hardware access point module for x86, Freescale, MIPs based industrial PC to have Access Point feature without porting WiFi driver in the host CPU platform. use Bointec CSW861K, an Mediatek MT7688 based low-power consumption IoT AP SoC based integrate Wi-Fi single chip solution, DP809K supports IEEE 802.11b/g/n stream, providing GPIO for intelligent control, and UART interfaces for device communication with access point/wifi repeater, wifi client feature. 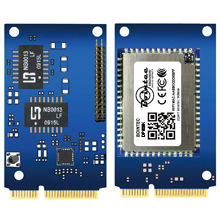 This completes networking platform enables any kind of electronics to add full-featured Wi-Fi to a wide variety of products with minimal development effort and cost. DP809K supports a network stack along with SSL security, enabling full-featured internet connectivity and reliable information exchange in a small, low-cost system. Without porting client based wifi driver, Bointec DP809K talk to host board by Using by a 10/100/1000 based Ethernet adapter. Therefore a host system developer can loosen the porting effort to let host board to play software Access Point. It can share host board’s CPU loading and hand over the Wifi job to DP809K. For EMI to the lab certification, Bointec DP809K is defined to pass 2.4GHz modular approval. It can allow the host system, when going to EMI laboratory, without go through the 2.4GHz test items and be awarded for the EMI approve certification such as Japan(MIC), US(FCC), Europe(CE) and Taiwan(NCC). DP809K has one MHF4 antenna connector and 32Mbits flash RAM. With an external power manage MCU, it is able to utilize 3.3V power source for best power consumption. The DP809K supports the PCI Express 1.1 bus interface for host communications with power management, and complies with the IEEE 802.3u specification for 10/100Mbps Ethernet.